You may get a little overwhelmed and confused about the vast JEE Main 2019 Syllabus, but until you have the dedication, hard work and confidence in your self you can easily crack JEE Main 2019. You just have to start early. If you are in class 11 or class 12 and are aspiring to appear in JEE Main 2019, gear up and start your preparations early. 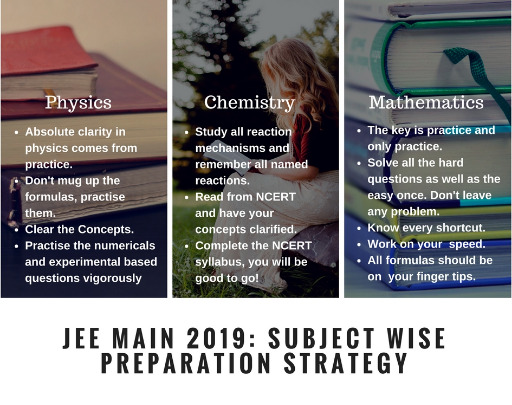 We are listing down tips here in this article on How to Prepare for JEE Main 2019. The toppers of previous years’ JEE Main exams have also shared their preparation tips which we will include here so that you can get a direction on how to get through with the preparations. Know the JEE Main syllabus. Know which chapter or subject needs the most preparation. Prepare a timetable accordingly. Divide the months and dedicate them to a particular Chapter or Chapters. Do not go beyond the Syllabus. Stick to the Syllabus prescribed by the JEE Main conducting board. It will be enough if covered completely. Practice, practise a lot. Practise the problems in NCERT books and reference books. Solve question papers. If you start early from today, you can go next level and solve question papers of other examinations like VITEEE, BITSAT, WBJEE, and JEE Advance. This will give you an edge over the difficult questions and you will get used to solving a variety of questions. Get any unclear concepts cleared. JEE Mains test your basic concepts and how familiar you are with them. Thus getting all your concepts from each subject cleared is a must. Dedicate at least 7 hours a day for JEE Mains Preparation. This is the average study time of the candidates who do well in JEE Mains. Do not break your flow. If you are engaged in a particular chapter, complete it then move to the next one. Do not left anything in the middle. Take care of your health by having a proper diet and study breaks. Falling ill on the D-Day is not what we need. Here are the list of important chapters from each subject. Make sure you cover them on a preference basis on your JEE Main 2019 Timetable. Physics: Electrostatics, Atoms and Nuclei, Oscillations and Waves, Current Electricity. Chemistry: Organic compounds containing oxygen, Ionic and chemical equilibrium, Chemical bonding, Thermodynamics and heat, Coordination compounds, Biomolecules and polymers. Mathematics: Integration, Vector and 3D, Coordinate Geometry, Permutation and Combination, probability, Trigonometry. Do not Procrastinate: Do not keep any topic for tomorrow, it will create a backlog. Backlogs are the most dangerous hindrance in your preparations. The timetable you have prepared must be followed with utter discipline. Quantity over Quality: Trying to solve everything just for the sake of it, won’t make any difference. While solving the problems make sure you are in line with the concept and theory. You must know which formula to use where and why you should use them. Piling up Doubts: Don’t let the doubts pile up. Try to solve them as soon as possible. Also, don’t stop because you are stuck in a doubt. Try to solve the doubts one at a time, or at the end of the chapter completion. Dependent on Coaching: Don’t remain too dependent on the coachings. Self-study is very important, without it you can not realise your strength and weaknesses. Study by yourself. Create notes in your own handwriting. Practice what you have practised in school/coaching again. You may come up with some new doubts or new ways to solve the same problem. Over Burden: Do bot just overburden your Timetable with the syllabus, give space to other activities to relax your self. Stay calm and composed throughout. Do not forget your school Boards: You must not worry only about the JEE Main preparations. Do not forget about your board examinations. Thus, if you finish your JEE Main 2019 Syllabus by December you stay in sync with Board examinations too. Teachers and JEE Main toppers highly recommend that you must not take Board Examination lightly. Do not Worry: Do not worry about the examination while preparing for it. Keep yourself focused on one thing. The toppers of JEE Main Examinations have also shared their tips on How To Prepare For JEE Main 2019. They share few tips on how to manage Board Examination and JEE Main Examination together. All toppers share that just ahead of the board examinations they made an extra effort to keep the worries of the entrance examination at bay. Concentrate on the curriculum of the CBSE Class 12 Board Exams for Physics, Chemistry and Mathematics. Don’t give NCERT Textbook problems a miss. There is usually a gap of about a week or 10 days between the JEE Main examination and CBSE Boards. Toppers feel that this is the time when they should focus only on solving sample papers for the entrance examination. Toppers feel that sample papers were the quickest way of determining which subject or which topic required their special attention in the limited time span. Thus, taking direction from the tips by the toppers on How To Prepare For Jee Main 2019, and with a consistent effort, you can crack the most prestigious entrance exam of the Nation. It is thus very clear that hard work, sincerity and consistency is the key to preparing for JEE Main Examination. JEE Advanced 2019 will be held. If I shall’nt clear jee adv. but have good marks in jee main then am i get admission in iit ?